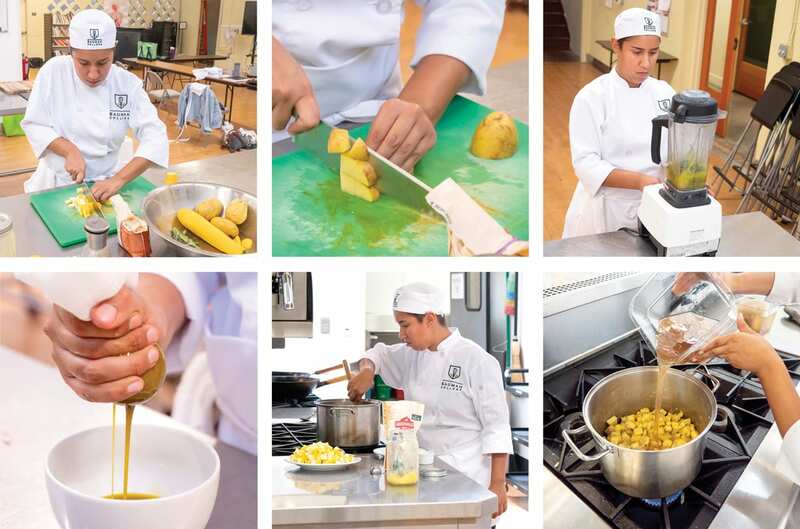 My name is Amanda Salazar and I am a recent Natural Chef Program graduate. My love for food stems from spending time in the kitchen with family. 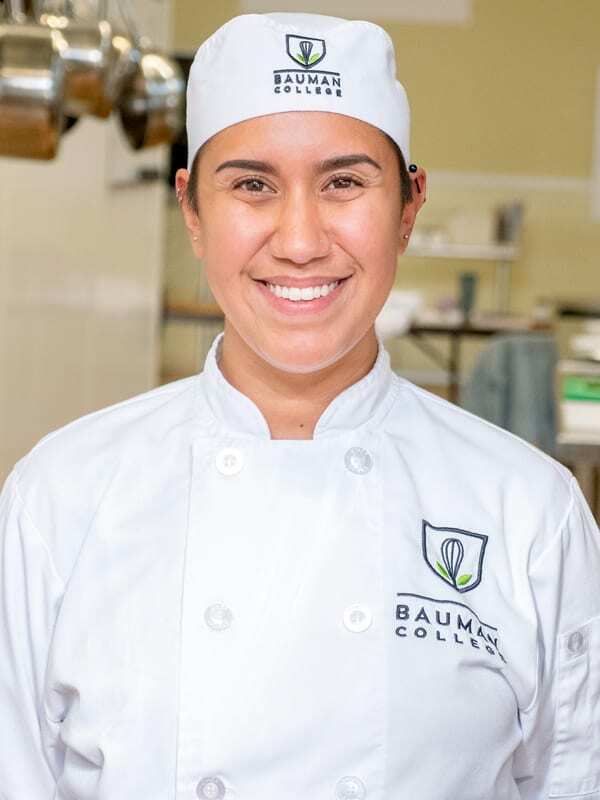 My passion for food combined with life experiences led to a desire for a healthier relationship with food, which brought me to Bauman College. No matter the external stress, food has always been my therapy. Spending most of my free time thinking about how to be involved with food, I knew I had to do something with that feeling and turn it into more than just a hobby. Being able to nourish those I care for and create lasting memories by cooking meals for them drove me to pursue a change in career paths. I was fortunate to learn so much from the program. While I am excited to pursue a career as a personal chef, I am going to miss my time spent in the classroom, learning the ins-and-outs of the kitchen and working with my classmates to create beautiful dishes. It is hard to pinpoint the most interesting thing I learned in the program—we covered a vast array of topics over the 5-month course. I will say that I found it absolutely fascinating learning about Indian cuisine and how it functions with six tastes, rather than the four or five we’re used to in most cuisines. They have sweet, salty, bitter, sour, pungent, and astringent, which I had never heard before! My two favorite cooking techniques that I learned in the program are steaming fish in parchment paper, a technique called cooking en papillote, and the technique of blanching and shocking a tomato after making a couple of slices into it to remove the skin easily, called tomato concasse. They seem like simple techniques, but taking those extra steps while cooking plays such a huge role in the end result in terms of the taste and presentation of the dish. It feels great to confidently say that I have these tools in my tool box. Soup is great any time of year. 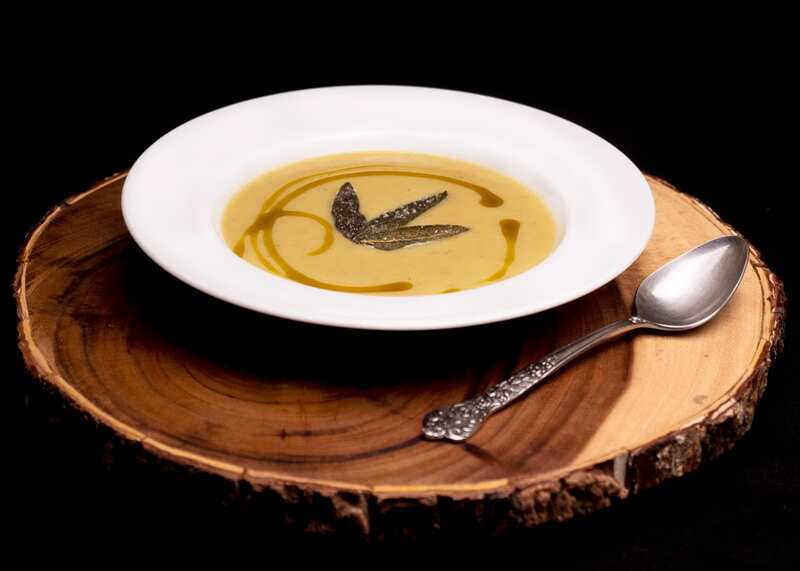 With the subtle flavors of squash and sage, the tastes of the season come alive in this light, nourishing dish. Serve it for lunch, as a before-dinner treat, or make it the main feature of your evening meal. This soup is gluten free and can be adapted for those who are sensitive to dairy or nightshades. In a high-speed blender, blend ½ bunch of sage with olive oil until sage is broken down. Pour blended mixture onto cheesecloth over a small bowl and squeeze out oil. Set aside. Heat a small saucepan on medium-high and add enough olive oil so that the bottom of the saucepan is covered. When oil is shimmering, add sage leaves and fry for about 30–40 seconds per side or until sage has changed color to a darker green. Remove from heat and place on a paper-towel-lined plate. Sprinkle with ½ teaspoon salt. Heat a large stock pot on medium and when warm, after about 2 minutes, add ghee. When ghee is shimmering, add onion and sauté until translucent, about 10 minutes. Sprinkle with 1 teaspoon salt about 5 minutes in to help draw moisture out of onions. While stirring, sprinkle brown rice flour over onions, continuing to stir until onions are coated. Cook for 1–2 minutes or until flour begins to become fragrant. Add garlic and cook until fragrant, another 1–2 minutes. Add squash, potatoes, ground sage, and ½ tablespoon of salt. Cook until squash softens, 5–7 minutes. Add vegetable stock and filtered water, and raise heat to bring to a boil. Once boiling, lower heat and simmer for 20–25 minutes or until potatoes have softened completely. Once softened, remove from heat. Add soup to a blender in small batches, and blend until completely smooth. Once smooth, add back to pot and stir in pepper, lemon juice, and salt to taste. Garnish with a drizzle of sage olive oil and fried sage leaves. Serve and enjoy!